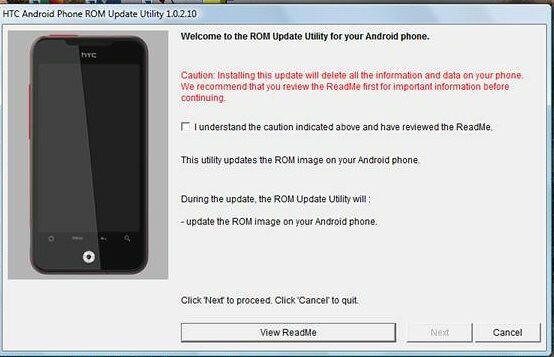 Thanks to Brett and mclarryjr for their outstanding [GUIDE] How to Root, Unroot and ROM your Droid Incredible thread. [WARN]WARNING: The information contained in this post could damage your phone beyond repair if instructions are not followed completely! With Gingerbread coming for our beloved DInc there will be many who will want to take advantage of the opportunity to load HTC’s Official Gingerbread. So, how should you prepare? There are three fundamental user types that I will address here: Rooted users who want to keep root, rooted users who don’t care if they keep root and Stock users. ssethv, Matt Passell, tomscot2 and 7 others like this. For users who are rooted and do not want to lose root, your task is simple. Do not accept the OTA. A rooted version will be available shortly after the official version starts rolling out; so be patient and wait for a rooted version to come out. Rooted OTA ROMS will be posted in the ROMS and Hack’s forum as well as in the ROM’s and Mod’s HQ thread as they become available. Use Root Explorer or another root compatible file explorer and rename /system/etc/security/otacerts.zip. to /system/etc/security/otacerts.zip.bak. kemblepdx, tony bag o donuts, CodeToJoy and 5 others like this. First and foremost, if you are rooted and you want the HTC Official Gingerbread OTA, you will need to un-root and return to stock. If you are rooted and running stock, you still need to un-root and return to stock. If you are running an AOSP ROM and you want the OTA you need to un-root and return to stock. If you are rooted and running a Sense based ROM you need to un-root and return to stock. Just in case I was not clear. If you are rooted do not accept the Official OTA unless you have un-rooted and returned to stock! For Windows users there is some prep work we need to do so that everyone is on the same page. These directions will work for XP, Vista and Windows 7. Step 1: Set Always show menus, Un-hide known file types and display hidden files. The Folder properties box will display. Then select the View tab in the properties box. Near the bottom of the options box you will see “Hide extensions for known file types,” if there is a check mark there, uncheck this option. 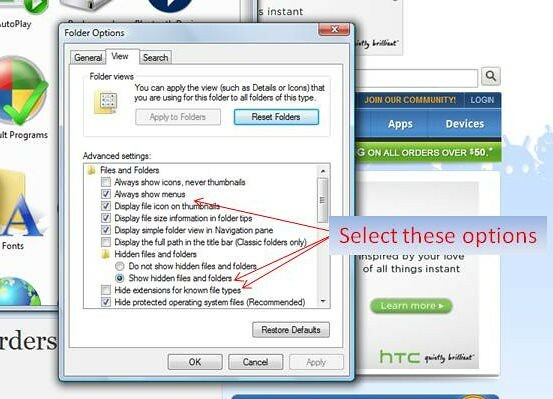 Just above “Hide extensions for known file types there is an option to “Show hidden files and folders.” Select Show Hidden files and folders. Click OK. When we are done, you can go back and put these settings back if you like. Step 2: Make sure your SD Card is formatted as FAT32. Connect your phone to your PC and choose Disk mode. When your SD card connects as a drive, open My Computer; Right click on the Drive for your SD Card and select Properties. A window will pop up that will show you the Format type for the drive. If it says FAT32 you are OK, if not, continue. Click on the Edit menu of the SD Card directory and select Copy. Then minimize the SD Card directory. Open the SDBackup directory you made on the Desktop and click anywhere inside the white file listing area of the box. Click on the Edit menu of the SDBackup Directory and select “Paste.” This will copy the contents of your SD Card to your PC. When the copy is complete, close all open windows. 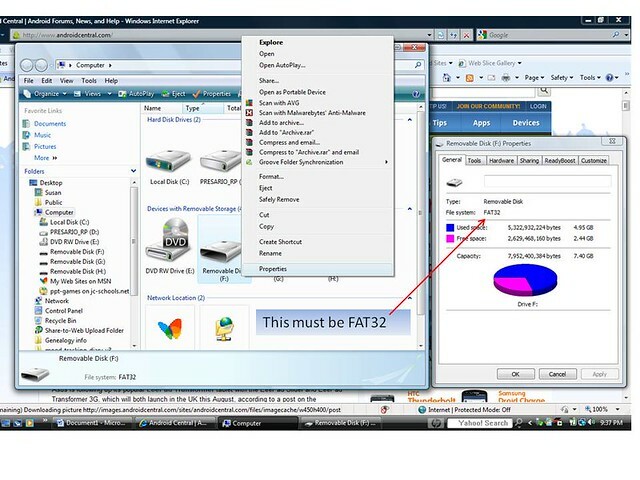 In the Format Removable Disk Property Box, select “FAT32” as the File System. Click Start. You may be prompted with warnings about formatting erasing all data, click OK and continue until the format is complete. Now copy your data from the SDBackup directory on your desktop to your SD Card using the same procedure outlined in steps E –I in reverse. Download a file manager program from the market, there are many available and most are free, if you want to copy your data on the phone. Or you can connect your phone to your PC. One of the drives that will appear is your SD Card the other is you Internal Storage. 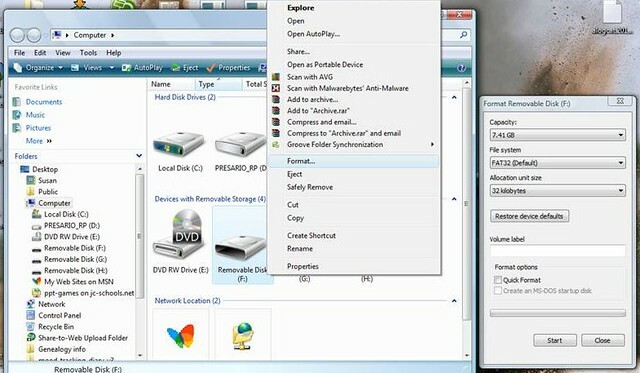 You can use your PC to copy and paste data from one drive to another. Under the /emcc directory you will find a DCIM folder copy the DCIM folder to a picture folder on your SD Card. Copy over any music folders, ringtone folders, video folders or any other miscellaneous data you may have stored on the internal memory to your SD Card. Do not delete them, just copy them. Download an SMS Backup program from the market, one called SMS Backup and Restore by Ritesh Sahu is a free app you can use. Backup to Gmail by cpedia Mobile is another app that will backup you calendar, SMS, MMS and Call log to Gmail, it is $1.99 in the market. SMS Backup + by Jan Berkel is another free app with good reviews. Set up an appbrain.com account and download the appbrain app to your phone from the Market. Appbrain will sync a list of all your installed apps to its server. This way you have a complete listing of all the apps you have installed, not just the paid apps tracked by the market. If you store your contacts locally on the phone rather than with Gmail, go into the People app and select Menu -> Import/Export. Follow the prompts to make a backup of your contacts to your SD Card. If you are paranoid about losing, game data there are several Angry Birds backup programs in the market. For other game apps search and see if there is a backup app available. Write down on a piece of paper what apps and widgets you have on each screen and put it in a safe spot. It's ol'skool but it works! Dark Wizard Matoya, davidnc, CodeToJoy and 2 others like this. MD5 for Mac - Free software downloads and software reviews - CNET Download.com For Mac. Copy the PB31IMG.zip to the root of the SD Card. Reboot into HBOOT by turning the phone completely off, then hold down the Power and Down Volume button at the same time to start. HBOOT will see the PB31IMG.zip file and prompt you for confirmation to install. Press the Power button to select yes. Once done you will be restored to Factory Stock Froyo with S-OFF. Reboot and follow the setup procedure to login to google and any other accounts you have like a normal setup. You are now ready for the Official Verizon OTA update. If you can not seem to get the PB31IMG image to load properly, you can load the Verizon RUU program on your PC. This only works on PC’s, there is no Mac version. Connect your Phone to your PC with the USB Cable and double click on the RUU executable you downloaded. On the first screen of the RUU program, you will see a “View ReadMe” button. Press this and read the entire document. Follow the directions exactly and do not deviate from them. I have attached a PDF copy of the document to this post so that you can download and read it in advance. CodeToJoy, Dark Wizard Matoya, Droid121572 and 2 others like this. Users who are running Stock software should follow these procedures to prepare. Download a file manager program from the market there are many available and most are free. Or you can connect your phone to your PC. One of the drives that will appear is your SD Card the other is you Internal Storage. You can use your PC to copy and paste data from one location to another. Go to Menu -> Settings -> Applications -> Manage applications and check your apps to see if any are on the SD card. If you have apps on your SD card move them to the phone before updating, then move them back after the update. The update will "break" apps installed on the SD Card. Step 2: When prompted, accept the OTA and let it install. If you are low on battery you may want to find a charger to make sure you dont lose power during the download and install. Dark Wizard Matoya, silentbobdrummer, zero neck and 3 others like this. Excellent work as always, Stig. PvilleComp and tony bag o donuts like this. tony bag o donuts and PvilleComp like this. Very well laid out - now I just need to decide which camp I'm in. I'm firmly in the "staying rooted" camp. I love Cyanogenmod too much to give it up, and even if I did want gingersense I would use a gingersense ROM with Sense 2 and no bloatwere instead of the official OTA. Yea, that's the way I'm leaning, too. The only thing that sways me is the new radio. I have drawn a mental line at flashing radios, for whatever reason, and with them officially updating it for GB, I'd be tempted to take the update and try to get root back after. I never flashed a radio until i got this thunderbolt, and since then i've flashed numerous radios. It's really not that scary as long as you calculate the checksum on your phone and make sure it's the right file etc. I wouldnt take the ota for the dinc, but my dinc is deactivated so i dont think it will recieve the update anyway. Far better then anything I've ever written. Well done Pville. When you plug in your phone to the computer it should ask if you want to use USB or Disk mode That is the option you want to see the SD card as a drive on your computer. If you want to keep root - do nothing! Wait for a stock rooted OTA to be posted. donut and skaterboy13 like this.